“Sensory evidence and factual knowledge” is unambiguous, and today we would read this as a reference to science. Given the constant reference to Egypt throughout the Old Testament, and given this explanation, it is strange to find virtually no references to this in the usual exegeses, and therefore to miss the relevance of this to modern times. This is partly because we tend to think of science as something relatively new, and so impervious to comment from a Bible that is not associated with such criticism in the popular mind, when in fact it is the word “science” itself that is new and not the form of understanding that it represents. 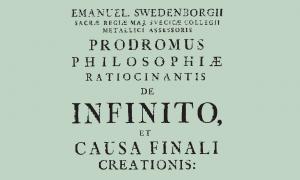 According to Dr. Marsha Keith Schuchard, during Swedenborg’s “long career, he gained fame as a military engineer, natural scientist, intelligence agent, and kabbalistic visionary.” The purpose of the following article is to show that there is little, if any, evidence for Dr. Schuchard’s last two classifications of Swedenborg. I do not feel that she has made a case for his being, in fact, “a secret agent on earth and in heaven.” More specifically, then, Dr. Schuchard has two basic hypotheses in her work on Swedenborg: One is that Swedenborg studied Jewish mysticism, or Kabbalah (also spelt Cabala), with Rabbi Johan Kemper, a lecturer at Swedenborg’s university, although Schuchard neglects to mention that Kemper had converted to Christianity before then,3 and later with Rabbi Dr. Falk in London. Her hypothesis is that Swedenborg mastered a vision inducement technique taught him by those men, which involved converting his sexual energies into psychic energies. Her second hypothesis is that Swedenborg was a Jacobite spy on behalf of the Swedish government and used secret Masonic networks to pass intelligence back to Sweden or to carry out secret missions. In Memoriam: James L. Pendleton M.D. by Donald C. Fitzpatrick Jr.